SHI - Software House International is the the current re-seller of software under UCOP agreement management. SHI sells software for UC owned computers at prices that are often below standard educational pricing. 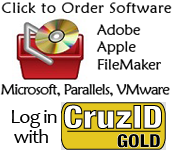 UC Agreement software: Adobe, FileMaker, Microsoft can be ordered by clicking the Software Order Form link, or with the SHI Punchout in CruzBuy. Computers under Standard Desktop Support order their software using the Software Order Form for order tracking and installation service. ITS can order and track your purchases and activation codes. SHI has committed to process and send your order to the appropriate vendor within hours of receiving your PO. Tax is charged for an entire order when CD/DVD media or documentation is purchased with license. When ordering software licenses from SHI, you will be asked to certify this statement during the order process: "All products purchased on this order are to be distributed via electronic download only. No tangible media or documentation is to be shipped in association with this order. Access to the products purchased on this order is in no way dependent upon any tangible media that may have been received prior to, or separately from, this order"